Fall asleep to the sound of waves lapping the shore. Our home are literally on-the-beach, NOT a 'short walk' or a '5 minute drive', there's not even a road to cross. Beautifully bright and airy, we have 2 of the 4-bedroom 280 sq metreed properties with a sandy beach in front and mountains behind. Located in Phuket's exclusive Cape Panwa, your views could not be better. Each property commands unobstructed vistas of the bay, its islands and, your sunsets are spectacular. The setting is extraordinarily tranquil yet is only a 15 mins drive from the vibrant bars and restaurants of Phuket Town and just 30 minutes from Patong. There is a large salt water commual pool (depth 1.50 meters) which can be enjoyed by adults and children alike. A minimart is around the corner for your convenience. I am the owner (fluent in Thai/English) and available 24/7 for emergencies and, from 9-4 pm for routine assistance. If there's anything you require in order to make your holiday more enjoyable, simply ask and I will do everything I can to fulfill your desires - after all, this is your holiday. Due to the natural reef in the waters outside our houses, the sea is more pleasurable at high tide to swim in. I speak fluent English and Thai and I used to work with an international airline company prior to moving to Phuket - this experience taught me a lot about the service industry and how to ensure our guests enjoy their stay with us by putting the guest's comfort and satisfaction as a priority. Having had kids of my own, makes me anticipate the other parents' and children's need, I will look after you as you were part of my family. I have always had a great affinity with Cape Panwa and southern Phuket for many years of my life. When the chance came to acquire some property here, I jumped at the chance - it's a very tranquil location on a busy island. First and foremost it's the views - they are stunning. We look out over blue seas, emerald islands and a beautiful bay. Secondly it's the fact that we're on the beach - Phuket is an island with a lot of beaches but very few properties have direct beach access. The property is spacious with 2 floors within the house, marble tiling and teakwood flooring in the bedroom. All are of fine finishing making a holiday away from home a blissful experience you long for. The Master bathroom is a luxurious suite with 2 basins, a WC, shower cubicle and a bath that looks over the bay so that the exquisite views may be enjoyed whilst you relax in bubbles. The other 3 of the bathrooms feature shower cubicle, basin and toilet. At the back of the development is the green mountain. The development sits right on the sand of the beach with no roads or walkways in between. Fully equipped western style kitchen, you can also order for an in-house chef to prepare you an authentic Thai dinner (set menu at extra cost). Our cooks can prepare a local meal (dinner) in your house on your request from a set menu at additional cost. With dining table (4 seats) and 3 sunbeds. We had the most wonderful time staying here. We have 3 kids and the Villa provided space and comfort for all of us. The kids really enjoyed playing in the pool, which overlooks the beach. The Villa has all the luxuries of home (&more). It was exceptionally clean, bright and spacious. Tanya went above and beyond to make our holiday as easy and enjoyable as possible. She provided assistance with access to transport, organised our day trips and recommended the most delicious beach front restaurant to eat at!! She also organised cooks to come to the apartment and prepare Thai food. We felt very welcomed and very lucky to have chose this place to stay. 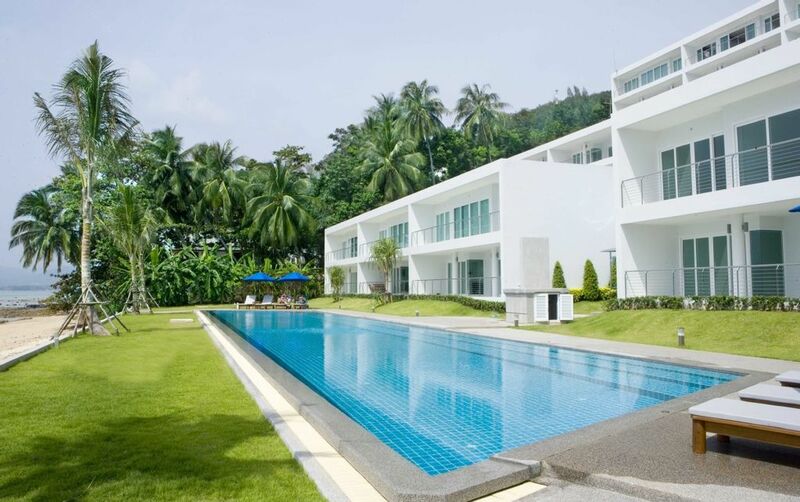 I would highly recommend this property, it is a calmer more peaceful slice of Phuket......I can't wait to return! It was our great pleasure to look after you guys especially the little ones. Hope to see you all again soon. This place is literally heaven on earth. The pool and beach right outside your door, great food and falling asleep to the sounds of waves. A group of us (7 adults and 2 children) stayed here for 12 days in late August/early September and it was one of the best holidays that we have ever had. The appartments are gorgeous and have everything you need and the pool is incredible and best of all we had it all to ourselves. The kids loved it as there are steps that run along the length of the pool which is great for small kids (our daughter was 3). There are lots of great places to eat nearby and some within walking distance. We spent a lot of time down at the local beach bar which does a great seafood grill and an awesome Thai massage. We hired a car when we got there (through Tanya) which was a great way to go. It was cheap, gave us lots of freedom and it was pretty easy to get around with the help of a good map (we used the I-pad map application). Tanya is great - welcoming, friendly and a great source of information on things to do and see. She booked a lot of our activities for us and even managed to get us discounts. We did not want to leave and will definately be back. We could not recommend this place more. We have recently returned from our stay at Villa A2. This was our 2nd trip to Thailand and we had forgotten what a wonderful place it is. We chose A2 as we were returning to Thailand with 2 children this time and the Villa was perfect for this. The kids spent most of the time in the amazing swimming pool which meant we got to relax! Although situated in a quiet area of Phuket you are only ever a relatively inexpensive taxi ride away from the fun of Patong or fabulous restaurants of Phuket Town. We found some lovely restaurants locally around the Cape. The view from the villa really is as good, if not better than it looks on the website. It's amazing. Thank you Tanya and staff for making us and our guests most welcome and I promise if (or should I say when) we return, i'll remember to switch my phone on! Thank you very much for your visit, it was also an enjoyable time having you staying with us too especially for Patrick playing with the Scarlet and Ben, has Ben forgotten how to write his name in Thai yet?? We are looking forward to seeing you guys again soon. What a fantastic two weeks. The villa was stunning. The facilities were very good, and extremely spacious. It's in a perfect location with its own beach. The swimming pool is very large with plenty of sun loungers around it to relax and take in the exquisite surrounding views. The owners were lovely and very helpful, assisting in organising excursions and great knowledge of where to eat. There are so many fantastic restaurants a couple of favourites are Tang Ka and Bak Nam. If possible get out to the islands, especially if you're a Bond fan. Pure paradise the type of place I'd go back too every year! Thank you so much for your review and staying with us. We hope to see you all again soon. What can we say except what a wonderful place! The villa was beautiful, and in a fantastic location - right on the beach, with views across the bay. Beautifully decorated, clean and gorgeous! Panwa is a little off the traditional tourist track, perfect for guests who want to see more of the real Thailand. But there's still plenty of restaurants and activities close by. Definitely try the Natural restaurant in Phuket town, Treetop and Bak Nam. The restaurants on the beach are brilliant for lunch or dinner too - very fresh, lovely food for amazingly cheap prices. Thank you very much for your visit, hope we will see you again soon. Have a great time back at home. We stayed for three weeks in January, and had the most fantastic time. The villa was more that we were hoping for. The facilities were great. the villa itself provided us with everything we needed and more. The pool was also great. The hospitality shown to us by all of the staff was 2nd to none. I personally don't believe that you would get better in any hotel. They also provided us with great recommendations for days out and restaurants. The Blue Elephant is a must!!!! We are looking forward to returning as soon as we are able to!!! Cape Panwa is known as the most peaceful and exclusive area of Phuket. It overlooks the charming Chalong Bay where the typical Thai 'long-tail' boats carry out their daily work. The adjoining beach is soft sand and the water is very warm with a reef that is exposed at low tide. Due to its location there are many activities to be enjoyed such as swimming, scuba-diving,sailing, windsurfing and pleasure boating. For those who prefer golf, there are 4 main golf courses within a 30 minute drive: Loch Palm Golf Club, Red Mountain and Blue Canyon/Mission Hills; all are of a very high standard. The local seafood restaurants are a short walk down the beach and specialize in wonderful Thai dishes. Phuket Town is 15 mins away by car and offers a wide range of restaurants, bars and shopping. Phuket Town is an authentic Asian city - a refreshing change from touristy towns like Patong (40 mins by car). Panwa offers the perfect holiday location for those wishing to relax but still enjoy an active nightlife. Other Activities: Bird watching, Dolphin watching, Elephant trecking, ATV riding, Nature walks, spa, city tour, Thai cooking class, scuba diving.